This is a totally new author for me…it sounds lovely. Vicki, this sounds so good! I’m glad that you enjoyed it so much. I need to listen to more audiobooks! I was never a fan of audiobooks until this year. I’ve “read” 16 books so far this year. Eleven of them were audiobooks. I’ve never listened to an audio book. I am going to have to check into it. This sounds so good! I only got addicted to them this year. I love them! I’ve heard that narrator and liked her work. The book (especially the audio version) sounds outstanding. I have never listened to a book and don’t think I would like it much. I want a book in my hands so I can go back, stop, start, re-read, etc. But I’m just an old fogey so you’ll have to excuse that, I hope. I’m glad that you enjoyed this book! Lowell, you can do all those things on a Kindle, and more. 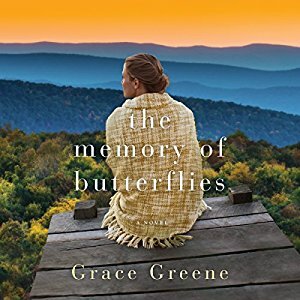 Thank you so much for the review and I’m delighted you enjoyed The Memory of Butterflies. Brittany Pressley did an absolutely fabulous job as narrator. In fact, having listened to some of her other work, I asked for her as narrator for this book and she surpassed all expectations. I love this book and plan on reading more of your books. I agree with you, Pressley did a great job. I listen a while in bed before going to sleep and always set the timer to turn it off in 30 min. or so because I usually fall asleep. The time makes it easy to go back to where you last remember listening. Going to add it to my audible wish list. Thanks for telling us about it! I like it too, sounds calming. The title stirred something up. Not sure what! It did to me too. Brings back memories of seeing a lot of yellow butterflies after losing my husband. His favorite color was yellow. When you wish for a book 2, then you know it’s good! Glad you enjoyed this one so much; sounds like a nice one. Thanks, it was really good! I like it when a book keeps giving me surprises. Sounds like good character development. Sounds really good. Great review!